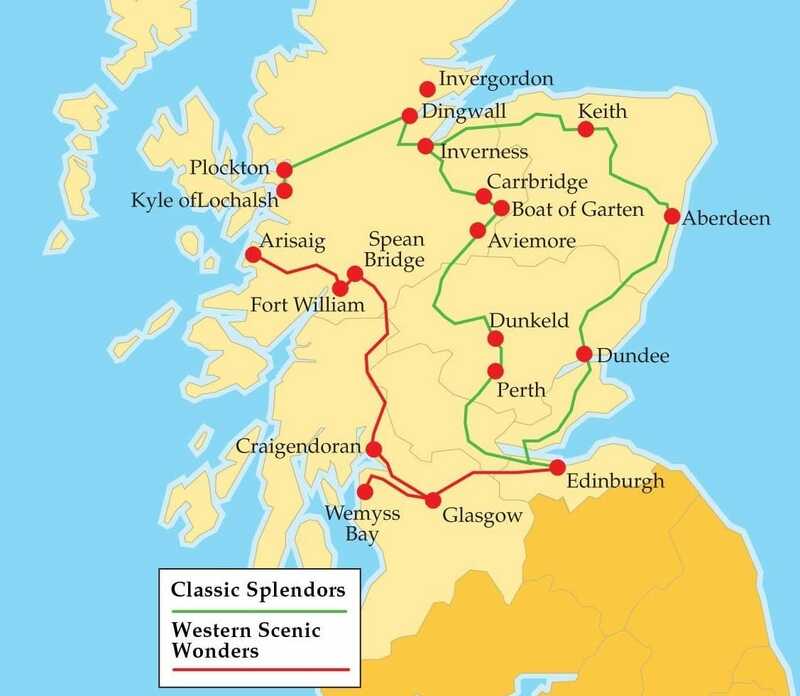 Belmond Royal Scotsman Scotland’s Classic Splendours Tour is one of the best in the world. From the bagpipes and intimate musical events, to the grand sweep of the moors and the gorges, the Belmond Royal Scotsman’s Classic Splendours Tour is a journey straight to the heart of the Scottish Highlands. Life on the train is relaxed and indulgent, with the freshest, finest local produce served in the dining cars. From Edinburgh, the train follows the east coast up to Keith, then journeys to the picturesque west coast village of Plockton, thence to Inverness and south to Perth. Two highlights: a private tour and tasting at Glen Ord Distillery and a personal tour of Ballindalloch, with its magnificent castle and gardens. Other activities include clay pigeon shooting or guided walking along Caledonian pine forest trails. Life on the train is relaxed and indulgent, with the freshest, finest local produce served in the dining cars and nights in the all en-suite sleeping cars spent at quiet sidings. This is one of IRT’s favorite train experiences — and once aboard, you will see why. Combine it with the Western Scenic Wonders Tour, and you have one of IRT President Eleanor Hardy’s favorite journeys of all time. Belmond Royal Scotsman departs Edinburgh in the early afternoon, traveling north across magnificent Forth Railway Bridge—one of the first cantilever bridges, completed in 1890. Enjoy afternoon tea as you journey through the former Kingdom of Fife. The train follows the east coast, passing through Arbroath, Montrose and Aberdeen before arriving in the market town of Keith. An informal dinner is served on board, after which you are invited to the Observation Car to enjoy entertainment with a Scottish flavor. A leisurely breakfast is served as the train travels west along the Moray Firth towards Inverness, capital of the highlands. From there, enjoy lunch as the train continues on to Kyle of Lochalsh, one of the most scenic lines in Britain. The line passes Loch Luichart and the summit and Achnashellach forest, descends to Strathcarron and runs along the edge of stunning Loch Carron. At Plockton, head out on a boat trip to view seals and admire the magnificent views across the bay to the Applecross Mountains. After, take a walk through the woodlands to a viewpoint overlooking the loch. Return to Plockton Hotel for a dram or two. stronghold of the clans Mackenzie and Macrae, the castle was largely destroyed in the 1719 Jacobite uprising and lay in ruins for two centuries. Lieutenant Colonel John Macrae-Gilstrap then bought the island and restored the castle to its former glory, also building a footbridge to provide access to the mainland. Back on board the train, a formal dinner is followed by entertainment in the observation car. Breakfast is served as the train departs Kyle and retraces part of yesterday’s route to Dingwall. From there, it heads to Garve, where you will disembark for a visit to Glen Ord Distillery, one of the oldest distilleries in Scotland. Enjoy a tour of the distillery and a private tasting and nosing session. Rejoin the train in Inverness, just in time for lunch, as it heads to Carrbridge for a visit to Ballindalloch, one of Scotland’s most romantic castles. The romantic baronial castle, known as the “Pearl of the North,” is the much-loved family home of the Macpherson-Grants, with treasures including a fine collection of 17th-century Spanish paintings, a sumptuous dining room, splendid vaulted hallway, and impressive library. Golfers can play on the estate’s course; clubs are available for rent. Return to train at Boat of Garten on private tracks of Strathspey Railway for overnight stabling. After an informal dinner, a Highlander brings Scottish heroes to life as he regales you with stories of local heroes and their derring-dos, even demonstrating some authentic weaponry. The day begins with an excursion to Rothiemurchus Estate, where you may choose from activities such as fishing, clay pigeon shooting or a tour of the estate. Rejoin the train at Kingussie and lunch while traveling south to Dunkeld. Disembark and visit Glamis Castle, Seat of the Earl of Strathmore and Kinghorne, and childhood home of the late H.M. Queen Elizabeth, The Queen Mother. Save time in your tour to visit the gorgeous gardens. Rejoin the train in Perth for a final formal dinner on board. Breakfast is served as the train leaves Dundee and crosses the Tay Bridge into the former Kingdom of Fife and on to Edinburgh, where your journey ends. *Scotch Malt Whisky Trail tour runs simultaneously on these departures. Please note prices are in British pounds. The Society of IRT highly recommends extending your stay with our Virtuoso preferred hotel The Balmoral. We get special rates and amenities for our passengers there – and it’s especially handy because it’s right at the train station — just an escalator down to the tracks. We also have wonderful guides and drivers at our fingertips. Please inquire if you wish this concierge service. Greater Savings on Longer Tours: Book the Grand Western Scenic Wonders (combines Classic and Western itineraries) and save!